OPEC is pointing the finger at speculators as well as Non-OPEC countries, but especially US shale producers for the crude price crash. Let's explore that idea in a series of charts. But first let's take a look at the allegation. The Wall Street Journal reports Gulf Oil Exporters Blame Non-OPEC Producers for Glut. Gulf oil officials on Sunday defended OPEC’s decision last month to keep its production ceiling intact, blaming producers outside of the group for the glut of oil on the market that has depressed prices. Speaking at an energy conference in Abu Dhabi, Saudi Oil Minister Ali al-Naimi blamed a lack of coordination from producers outside the Organization of the Petroleum Exporting Countries—along with speculators and misleading information—for the slump. 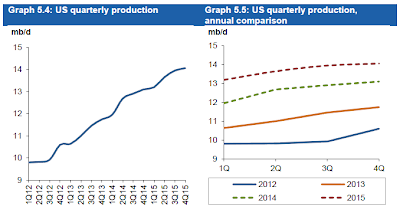 OPEC officials have singled out American shale producers as a particular problem. U.S. oil production has soared as a result of the shale boom, reducing OPEC exports to the U.S.
Non-OPEC producers “will realize that it is in their interests to cooperate to ensure high prices for everyone,” Mr. Naimi said. Are US shale frackers really to blame for the price crash? 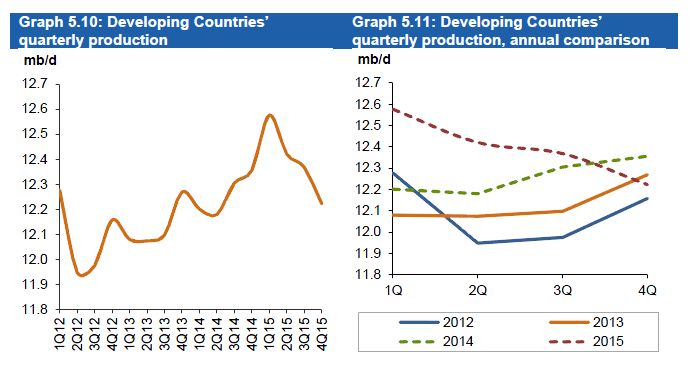 Let's take a look using OPEC's own data. Please consider charts and other analysis from the OPEC December Monthly Oil Market Report. 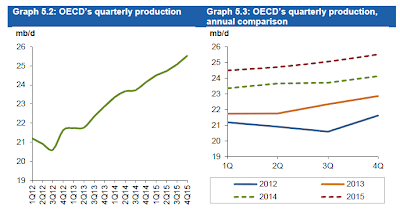 Non-OPEC oil supply is estimated to grow by 1.72 mb/d in 2014 to average 55.95 mb/d. In November, OPEC crude oil production averaged 30.05 mb/d, according to secondary sources, a decrease of 0.39 mb/d over one month earlier. 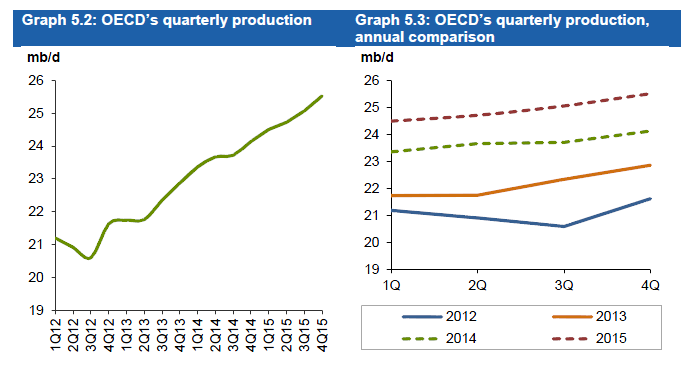 OECD Americas’ oil production is estimated to increase by 1.54 mb/d in 2014 to average 19.67 mb/d, the highest among all non-OPEC regions, indicating an upward revision of 10 tb/d from the previous MOMR. Strong estimates for both the US and Canada constitute the main factor behind expected supply growth, while heavy declines are seen in Mexico. Russia’s oil supply is estimated to increase by 0.05 mb/d in 2014 to average 10.56 mb/d, an upward revision of 20 tb/d from the previous MOMR. Production reached a record 10.67 mb/d in November as per preliminary data, an upward revision of 80 tb/d in 4Q14, with current production data for October and November indicating higher-than-expected output. 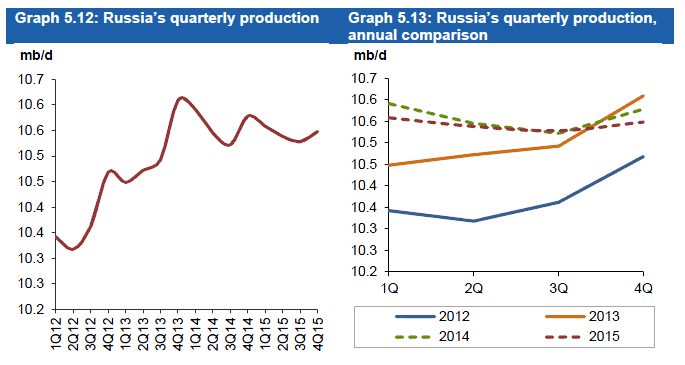 Russia’s production is expected to average 10.58 mb/d in 4Q14, an increase of 60 tb/d from 3Q14. Based on preliminary oil production by companies in November, not only was output not reduced, but there was an increase in volume. 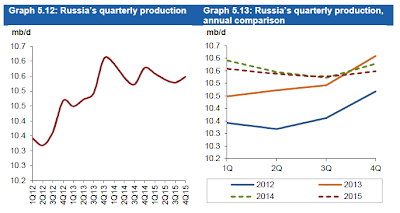 However, it is anticipated marginal barrel output in Russia for 2015 could decline y-o-y, given the impact of sanctions, low prices and lack of large projects expected to come online. Nevertheless, the approval of a tax overhaul by the Russian parliament, reducing crude export duty from its current 59% to 42% in January, could encourage oil producing companies in Russia to produce more. Total OPEC crude oil production dropped in November to average 30.05 mb/d, according to secondary sources, down by 0.39 mb/d from the previous month. Production from, Iraq increased, while crude oil output mainly in Libya, Saudi Arabia and Kuwait fell. According to secondary sources, OPEC crude oil production, not including Iraq, stood at 26.69 mb/d in November, down by 0.44 mb/d over the previous month. 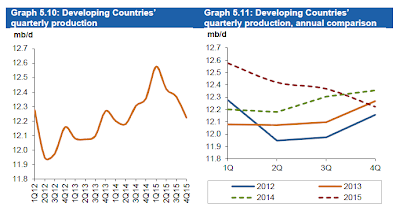 Preliminary data indicates that the global oil supply decreased 0.19 mb/d in November 2014 to average 92.69 mb/d. 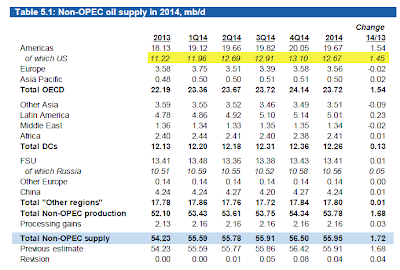 Non-OPEC supply experienced growth of 0.20 mb/d, while OPEC crude oil production decreased by 0.39 mb/d. The share of OPEC crude oil in the global supply declined to 32.4% in November. This estimate is based on preliminary data for non-OPEC supply, estimates for OPEC NGLs and OPEC crude oil production from secondary sources. Let's dismiss the notion speculators are responsible. Speculators, don't take delivery of significant amounts of oil (if any at all) and they don't set prices, but they can swing day-to-day volatility and perhaps exaggerate trends in both directions for a while. Ultimately this is a supply-demand issue. 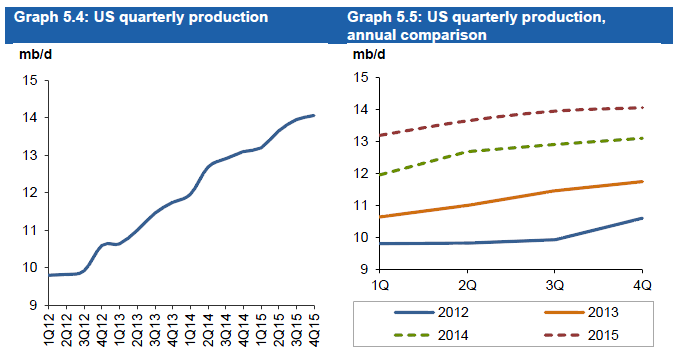 US production is up by 1.45 million barrels a day since a year ago. Total world supply is about 93 million barrels a day. The increase in US production amounts to 1.56% of global supply. Singling out the US is absurd. There are 12 OPEC countries vs. the rest of the world. 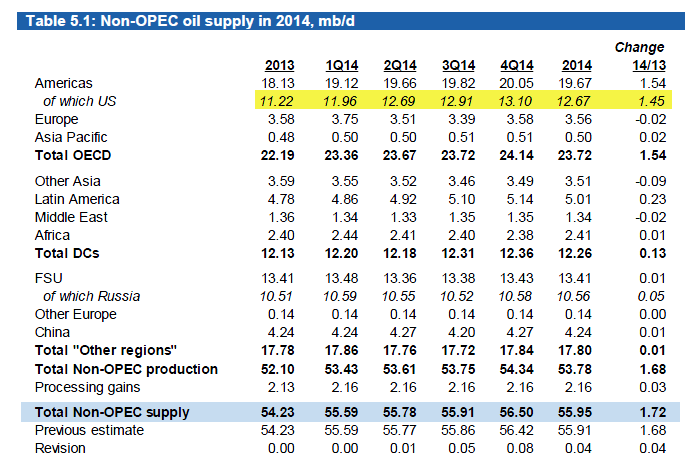 Those 12 OPEC countries represent 32.4% of global supply. 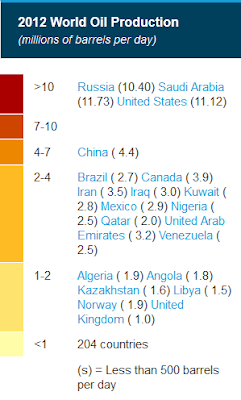 In total, there are over 200 countries that produce oil according to the US Energy Information Administration (EIA). An EIA chart (2012 data) will help put things in better perspective. It should be pretty easy to spot the problem. Countries as well as oil producers in those countries act independently. Thus, Saudi Oil Minister Ali al-Naimi's statement "Non-OPEC producers will realize that it is in their interests to cooperate to ensure high prices for everyone” is laughable. Every country in the world wants the other countries to be the ones to cut supply. Cooperation is not going to happen. OPEC cannot even agree among its own members. For further discussion, please see What's Behind the Plunge in Oil? Winners and Losers? Boon to Spending or Recessionary?